While traveling outdoors through Tamriel, adventurers will encounter many animals and monsters. As with almost all creatures in the game, they are generated according to leveled lists: high-level characters will encounter much more dangerous creatures than low-level characters. Note that in addition to the creatures documented here, there are NPCs that will also be encountered along the roads and in the wilderness. The most common are bandits, who have a 50% chance of being randomly generated at fifty locations along the roads (using the list "LL1RoadBandit") and will always be found in the various Bandit campsites scattered across the countryside. Highwaymen (technically a sub-category of bandit) are also found at several locations along the roads. The lists used to generate outdoors creatures are more complex than most leveled lists. Instead of a single, widely used leveled list, there is a different list for each type of terrain encountered in Tamriel. For each type of terrain, there is one list used to generate creatures found along roads and a second list used to generate creatures found in the middle of the wilderness. The two lists generally contain the same creatures, but the creatures are encountered two levels earlier along roads than in the wilderness. So the Imperial Legion's standard advice ("If you've got to travel, by the Nine Divines, stay on the roads! The wilderness just isn't safe anymore") really isn't true: along the roads you will encounter more difficult, boss-level creatures. Of course, it should also be noted that along the roads are the occasional Imperial Legionary, which will provide you with more support than you would have in the wilderness. All of these lists have a 100% probability of generating a creature, but if you are lucky the creature will be a deer instead of a hostile creature. Also, these creatures are only generated when a player character enters the corresponding cell. NPCs such as townspeople who traverse the wilderness will not normally encounter hostile creatures; their travels only become dangerous if the player accompanies them. Each entry shows the level at which the given creature will first be encountered in the given type of terrain. * Deer first appear at level 1 in all of these lists, but are also repeated at higher levels (e.g., 10, 19) to ensure that deer are always one of the possible creatures, no matter how high the character's level. 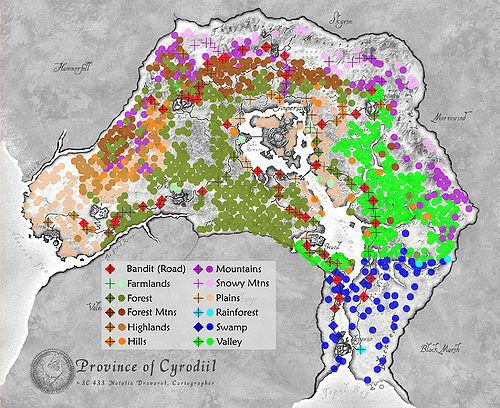 The following map shows where each of these creatures is found in Cyrodiil, according to the name of the region used for the creature's leveled list. Diamond symbols are used for road lists; circles are used for wilderness lists. This page was last modified on 17 October 2015, at 20:23.